couple of bucks if we make our own. Not to mention all the fun in building it. and this includes free shipping all the way from from China. Do a search for “Arduino SD Card” and up pop quite a few of of these babies. (well, whaddya expect for $2? ), so the first thing to do is check for shorts. MOSI pins are not shorted to ground. clearly marked on the board (see illustrations). in the bottom row, so you can use either pin in any given two-pin column. These breakout boards are quite nice, especially at the price. for this ourselves if we don’t wish to damage the SD cards. More on this in the next step. Constructing the project looks pretty simple at first glance. Just connect power and ground, and the four signal pins. to connect to, right? Well, yes, but there’s a complication. level. But, most Arduinos output 5 volts on their digital logic outputs for ON. 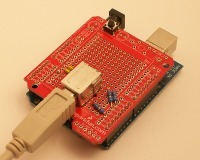 A direct connection of 5v to an SD card could fry it. So, what do we do? putting 5v on the input of a non-inverting buffer and getting 3.3v from the output. Shifting the voltage level, get it? But just how is this magic accomplished? here a 4050, and power it (pin 1, Vdd) at 3.3v. 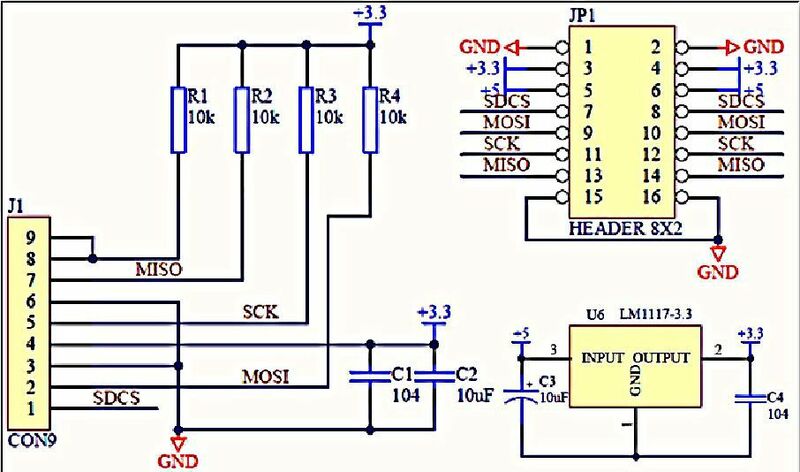 input pin 14 (gate 6) results in 3.3v on output pin 15. Now, let’s build the shield. with prices ranging from $4 and up. not the first shield you’ve built, so I won’t go into too much detail.